May be used in either offset or center post position. Supplied with composite base. Brandt instrument stands combine stability with mobile convenience. 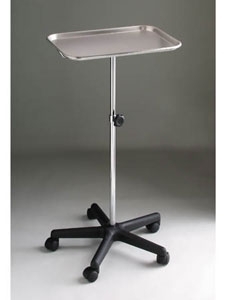 They feature chrome steel frames, 12 1/2" x 19" stainless steel trays and 2" dual wheel casters. © Brandt Industries 2009. All rights reserved.